As Canadians, it's our duty to engage in the democratic process. And as registered nurses, nurse practitioners, and nursing students, it's up to us to make sure important health issues are on the election agenda. Even though health is a provincial responsibility, the federal government has a vital role to play in keeping Canadians healthy, and RNAO wants each federal political party to put health first during the campaign. We encourage nurses and all Canadians to actively participate in the electoral process, including: running for office, getting to know candidates and key issues, attending events, signing one of our action alerts, and casting an informed vote. 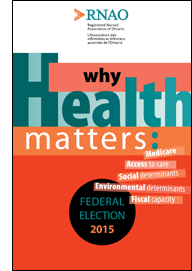 To guide you through this election campaign, we have created a myriad of in-depth resources detailing the 2015 federal election issues that will keep Canadians healthy. These policy priorities were developed through extensive research and consultation with stakeholders across the country. Our political action toolkit will help you get involved. And we are hosting events across the province where our members will ask candidates tough questions on health and social policy.